If your young niece or nephew is an avid reader, it’s likely because they are skilled at reading, not the other way around. 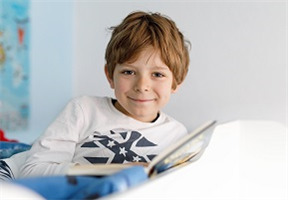 Authors of a new study of more than 11,000 7-year-old twins published in the Journal of Child Psychology and Psychiatry found that, contrary to popular belief, children who are good at reading are likely to read more. In other words, it isn’t the practice of reading that develops children into becoming avid readers, but rather it's their confidence in reading that leads to children reading more often. On the other hand, the researchers found that children who don’t like to read are also likelyto find reading challenging. While the researchers say that reading skills are “highly heritable,” how much a child reads is “influenced equally by genes and the environment.” Finding books and other reading options that are at the child’s reading level is likely to give your niece or nephew the confidence to keep reading and reading more often. For these kids, practice will help develop their reading skills.